Your Holiness Vladyko, Merciful Father! 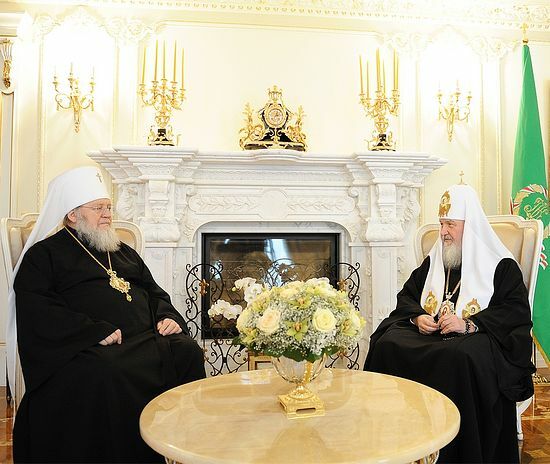 It is with a sense of exceptional joy and spiritual enthusiasm that I congratulate Your Holiness, and in your person, the entire Local Russian Orthodox Church, on your namesday, and the day of Slavic Literature and Culture! We now pray to the holy brothers, Equal-to-the-Apostles, who labored in earnest to illuminate the Slavic peoples. We lift up our prayerful gratitude to the Chief Pastor Christ for His generous blessing, by which the tree of the Slavic Churches grew, and thanks to which it has brought forth abundant fruits, the juices of which continue to quench the spiritual thirst of a multitude of children of the Orthodox Church. In our prayers we fervently beseech God that He preserves you in good health, well-being and peace. May Christ crown with many years your life, which is so valuable to the Church, so that you may adorn the historically-glorious Patriarchal Throne of the great Russian Church with your benevolent Patriarchal labors! Expressing our deep gratitude for the warm reception given to Archbishop Mark of Berlin and Germany, temporary member of the Holy Synod, and to Bishop Theodosius of Seattle, who is heading a delegation of young singers of the Russian Orthodox Church Outside of Russia, who witness with great joy their love for the Russian Church and their historic Homeland, we burn with the desire to strengthen the communion of the Church of the diaspora with the Church of the Fatherland. May our Founder and Head of the Church, Christ our Savior, be the pillar of this good endeavor. May the Lord bolster Your Holiness and bless your labors to the glory of our Church and the benefit of the Russian world! May the Lord grant us all “according to the riches of his glory, to be strengthened with might by his Spirit… that Christ may dwell in our hearts by faith; that we, being rooted and grounded in love… might be filled with all the fulness of God” (Ephesians 3:16-17,19).